The following are current or upcoming projects. As co-chair of the VKC AIDE Taskforce, I develop, and organize diversity & inclusion focused seminars and training. The topic areas I enjoy delving into are the aspects of intersectionality and cross-cultural/intercultural relations, which is a common theme for the trainings and webinars I conduct. Notables is a monthly e-newsletter to share stories about discoveries and best practices that are opening doors and transforming lives for children and adults with intellectual and developmental disabilities and their families. The work of the VKC AIDE Taskforce was a featured item. VKC A.I.D.E. 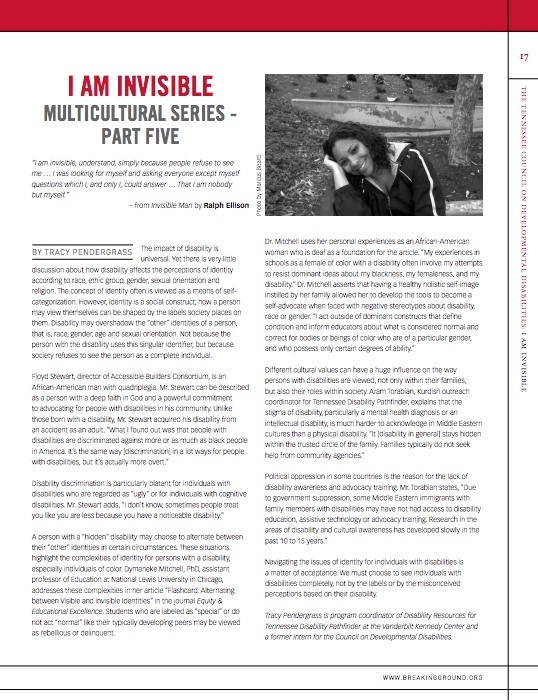 Newsletter is a quarterly publication to educate and inform faculty, staff, and trainees on issues regarding diversity, inclusion and equity at the Vanderbilt Kennedy Center. The following are my past projects. I develop and organize diversity & inclusion focused conferences, seminars, workshops, and trainings. The topic areas I enjoy delving into are the aspects of intersectionality and cross-cultural/intercultural relations, which are common themes for the learning events I conduct. The purpose of this seminar was to discuss how the roles of race, language differences, and religion play in the lives of people with disabilities, their families, and access to services. I am the Vanderbilt Kennedy Center UCEDD/LEND representative for the Association of University Centers on Disabilities' Multicultural Council. I have served as a member of the Multicultural Council since 2010. Currently, I serve as the Training Subcommittee Chair. My role as the Training Subcommittee Chair is to organize and facilitate the Multicultural Council's sponsored webinars, AUCD Conference Plenary Sessions, and eLearning for the AUCD network. This webinar provided an overview of the parallel backgrounds of LGBTQ+ and disability communities, as well as discuss the possible spaces for coalitional activist work. In addition, the particular concerns of people with I/DD who identify as LGBTQ+ will be addressed, and suggestions and resources for further points of connection will be given. This webinar presented best practices on developing culturally and linguistically competent support groups and utilizing support groups in research. Vanderbilt Kennedy Center for Excellence in Developmental Disabilities highlighted two of its projects: Hispanic Parent Support Group and Parent Stress Intervention Research Project. The Cultural and Linguistic Competence Assessment for Disability Organizations (CLCADO) was developed specifically for this purpose. The CLCADO is intended to support organizations to (1) plan for and incorporate culturally and linguistically competent values, policies, structures, and practices in all aspects of their work; (2) enhance the quality of services, supports, and advocacy provided to diverse and underserved communities; (3) effect change in education, training, technical assistance, research, and public policy; and (4) advance cultural and linguistic competence as an essential approach to address racial and ethnic disparities and promote equity for people who experience disabilities and their families. webinar examined the rationale, benefits, and process for self-assessment and introduced the CLCADO. The following are publications I authored or co-authored. I developed this tool along with my colleagues (Megan Hart and Alexander Santana) to assess the cultural readiness of The Vanderbilt Kennedy Center’s (VKC) policies, structures, and practices that address cultural differences with an inclusive approach that promotes equity in services. Click here to download the assessment report. You can view my VKC page, by clicking here.